Sample was done in Peaches & Crème Light Blue. Gauge: 4.5 sts. per inch, not critical You want the bib to be fairly dense, so if the fabric is too loose, just drop down a needle size. This pattern requires you to cast on stitches at the beginning of the first few rows of the pattern. I prefer to use the knitted cast on method, but you can use any method that you like. Just remember to keep the stitches tight. The ties are done by making I-cords. It’s helpful, but not necessary, to drop down a needle size when knitting the cords. I like to run a long tail down the center of the cord to finish it off. Be sure to use a straight needle and not one with a bent tip! Row 1: (right side) p1, k1, across row. Row 12: p1, k1 for 13 sts. ; k3; p1, k1 for 11 sts. ; k5; p1, k1 for 6 sts. Row 13: k1, p1 for 5 sts. ; p2; k3; p2; k1, p1 for 10 sts; k3; p1, k1 for 13 sts. Row 14: p1, k1 for 11 sts. ; k2; p3; k2; p1, k1 for 10 sts; p3; k1, p1 for 7 sts. Row 15: k1, p1 for 5 sts. ; p2; k4; p3; k1, p1 for 5 sts. ; p2; k4; p1, k1 for 13 sts. Row 16: p1, k1 for 6 sts. ; p6; k1, p5; k1, p6; k1, p5; k1, p1 for 7 sts. Row 17: k1, p1 for 4 sts. ; k2; p1; k5; p1; k6; p1; k5; p1; k7; p1, k1 for 5 sts. Row 18: p1, k1 for 4 sts; p9; k1; p4; k1; p6; k1; p4; k1; p2; k1, p1 for 5 sts. Row 19: k1, p1 for 4 sts. ; k4; p4; k8; p5; k8; p1, k1 for 5 sts. Row 20: p1, k1 for 4 sts. ; p8; k1; p4; k1; p10; k1; p4; k1, p1 for 5 sts. Row 21: k1, p1 for 4 sts. ; k6; p1; k8; p1; k1; p1; k3; p1; k7; p1, k1 for 5 sts. Row 22: p1, k1 for 4 sts. ; p7; (k1, p3) 2x; k8; p6; k1, p1 for 5 sts. Row 23: k1, p1 for 4 sts. ; k7; p1; k6; p1; k3; p1; k4; p1; k5; p1, k1 for 5 sts. Row 24: p1, k1 for 4 sts. ; p5; k1; p4; k1; p3; k1; p8; k1; p5; k1, p1 for 5 sts. Row 25: k1, p1 for 4 sts. ; k5; p1; k10; (p1, k3) 2x; p1; k4; p1, k1 for 5 sts. Row 26: p1, k1 for 4 sts. ; p4; (k1, p3) 2x; k1; p4; k4; p3; k1; p4; k1, p1 for 5 sts. Row 27: k1, p1 for 4 sts. ; k4; p1; k3; p1; k4; p1; k3; p1; k4; p1; k3; p1; k2; p1, k1 for 5 sts. Row 28: p1, k1 for 4 sts. ; p3; k1; p3; k1; p4; k1; p9; k1; p2; k1; p3; k1, p1 for 5 sts. Row 29: k1, p1 for 4 sts. ; k4; p1; k12; p1; k5; p1; k3; p1, k1 for 7 sts. Row 30: p1, k1 for 4 sts. ; p2; k1; p3; k1; p5; k1; p12; k1; p3; k1, p1 for 5 sts. Row 31: k1, p1 for 4 sts. ; k4; p1; k12; p1; k6; p1; k2; p1, k1 for 7 sts. Row 32: p1, k1 for 4 sts. ; (p2, k1) 2x; p7; k1; p4; k2; p5; k1; p3; k1, p1 for 5 sts. Row 33: k1, p1 for 4 sts. ; k4; p1; k10; p1; k8; p1; k2; p1, k1 for 7 sts. Row 34: p1, k1 for 4 sts. ; (p2, k1) 2x; p7; k1; p1; k1; p8; k1; p4; k1, p1 for 5 sts. Row 36: p1, k1 for 4 sts. ; (p2, k1) 2x; p3; k4; p5; k5; p6; k1, p1 for 5 sts. Row 37: k1, p1 for 4 sts. ; k7; p1; k9; p1; k3; (p1, k2) x2; p1, k1 for 7 sts. Row 38: p1, k1 for 4 sts. ; (p2, k1) 3x; p3; k1; p2; (k1, p6) 2x; k1, p1 for 5 sts. Row 39: k1, p1 for 4 sts. ; k6; p1; k10; p1; k3; (p1, k2) 2x; p1, k1 for 7 sts. Row 40: p1, k1 for 4 sts. ; (p2, k1) 3x; p3; k1; p10; k1; p5; k1, p1 for 5 sts. Row 41: k1, p1 for 4 sts. ; k3; p4; k2; p1; k7; p1; k3; (p1, k2) 2x; p1, k1 for 7 sts. Row 42: p1, k1 for 4 sts. ; (p2, k1) 3x; p3; k1; p10; k1; p3; k1, p1 for 7 sts. Row 43: k1, p1 for 4 sts. ; k2; p1; k3; p1; k5; p1; k3; p1; k1; p3; k2; p1; k3; p1, k1 for 7 sts. Row 44: p1, k1 for 4 sts. ; (p3, k1) 3x; p2; k3; p1; k1; p3; k1; p4; k1, p1 for 7 sts. Row 45: k1, p1 for 4 sts. ; k2; p1; k4; p4; k7; (p1, k3) 2x; p1; k2; p1, k1 for 5 sts. Row 46: p1, k1 for 4 sts. ; p4; k1; (p3, k1) 2x; p9; k1; p4; k1, p1 for 7 sts. Row 47: k1, p1 for 4 sts. ; k2; p1; k3; p1; k1; p1; k7; (p1, k3) 2x; p1; k4; p1, k1 for 5 sts. Row 48: p1, k1 for 4 sts. ; p6; (k1, p3) 2x; k1; p5; k1; p3; k3; p2; k1, p1 for 5 sts. Row 49: k1, p1 for 4 sts. ; k10; p5; k4; p1; k3; p1; k5; p1, k1 for 5 sts. Row 50: p1, k1 for 4 sts. ; p4; k3; p3 k1; p18; k1, p1 for 5 sts. Row 51: k1, p1 for 4 sts. ; k19; p1; k5; p1; k3; p1, k1 for 5 sts. Row 52: p1, k1 for 4 sts. ; p4; k1; p5; k1; p18; k1, p1 for 5 sts. Row 53: k1, p1 for 4 sts. ; k20; p1; k3; p1; k4; p1, k1 for 5 sts. Row 54: p1, k1 for 4 sts. ; p6; k3; p20; k1, p1 for 5 sts. Row 55: k1, p1 for 6 sts. ; k27; p1, k1 for 5 sts. Row 56: p1, k1 for 6 sts. ; p25; k1, p1 for 7 sts. Row 57: k1, p1 for 8 sts. ; k23; p1, k1 for 7 sts. Row 58: p1, k1 for 8 sts. ; p21; k1, p1 for 9 sts. Row 59: k1, p1 across row. Row 60: p1, k1 across row. Row 61: k1, p1 across row. Row 62: p1, k1 across row. Row 63: k1, p1 across row. Row 64: p1, k1 across row. Row 65: k1, p1 for 13 sts. Slip sts. just worked onto stitch holder, bind off the next 12 stitches knitwise; work across remaining sts. in established pattern: 13 stitches each side. Row 68: p1, k1 across row. Row 70: p1, k1 across. Row 66: (wrong side) k1, p1 across row. Neck decreases: All the decreases are made on right side rows. I'm not a big monkey fan, but this has to be the cutest bib ever! Hi! I volunteer on the Board for a non-profit group called Las Madres. We're having a Luncheon and looking for items for our Goodie Bags. I was going to make a "Knitting" bag and include some yarn. I was hoping to also include some of your patterns. Please let me know if I have permission to do this. Thank you! I have tried many times to print out this pattern... only th 1st page prints, and then follows with only the "notes" down the right hand side of the pattern! If I have to resort to writing it out by hand, I will! 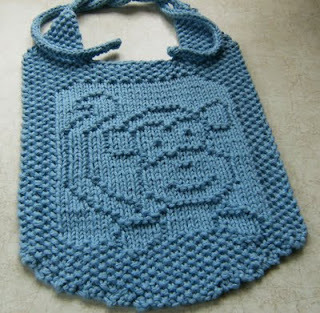 However, I am so anxious to be able to get knitting this very cute little cloth! Cathy, try and copy all the text from the web page and paste it into a Word document (or other word processing program), then you can edit and print properly. I love this monkey bib. I've tried making it, but the written form confuses me. Is there a grid-type pattern for this adorable bib? I just finished the Monkey cloth and am starting the Lion cloth. So far they are ADORABLE! I plan to make all the jungle animals as a gift for a friend who is having her second child and their nursery is a "Jungle theme." I just wish you had a giraffe! Just finished the Monkey bib for my friend's daughter. Quick knit and adorable too! You are so talented, thanks for all the free patterns!! !